It was the beginning of it all . 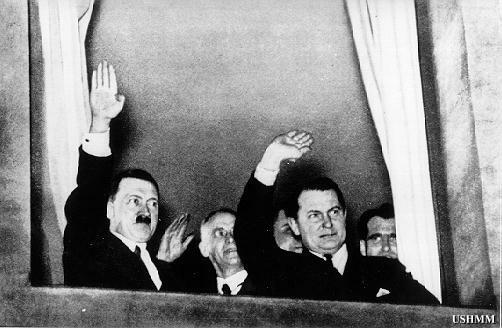 . .
Adolf Hitler appointed chancellor of Germany! 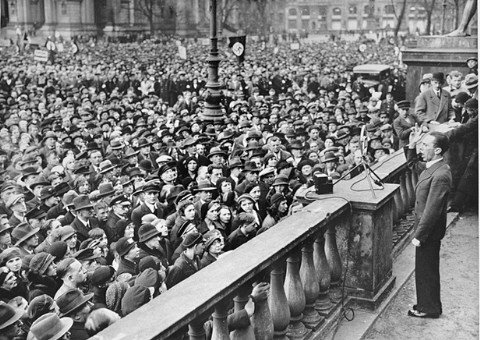 On January 30, 1933, Adolf Hitler is elected to the position of Chancellor of Germany, giving large control to himself and his Nazi party. This event marks an enormous accomplishment in a series of conquests that made up Hitler's unbelievable rise to power in the "Fatherland". This structure was the seat of the German government. 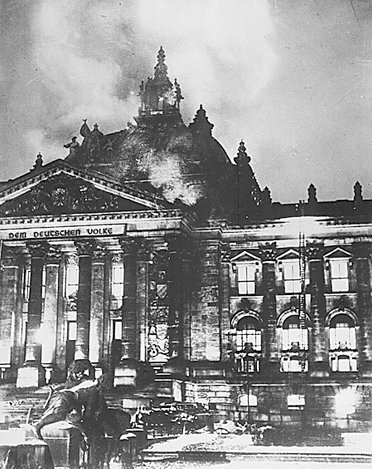 It was set on fire by the Nazis on February 27, 1933; and its destruction allowed Hitler to seize power while justifying his actions by claiming that he was protecting the security of the German people. 1933 was a year of much action and many happenings. 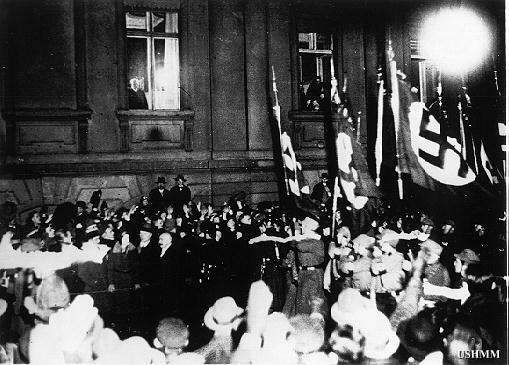 Among them was the official opening of the first concentration camp by the name of Oranienburg on March 12. It was patrolled by the SA(Sturmabteilung), which was later replaced by Himmler's SS. Among the primary camps were: Dachau in southern Germany near Munich, Buchenwald in central Germany near Weimar, and Sachsenhausen near Berlin in the north. 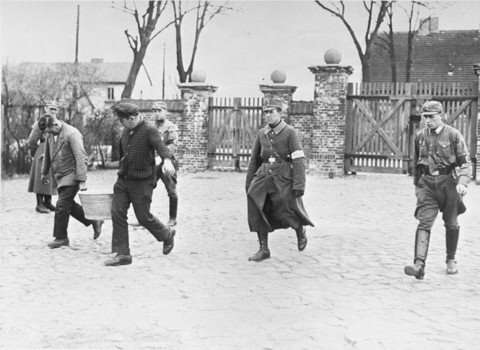 The camps were used to store political enemies, as well as other opponents of Hitler, mainly the Jews, that were imprisoned without any trial proceedings and no hope of appeal. 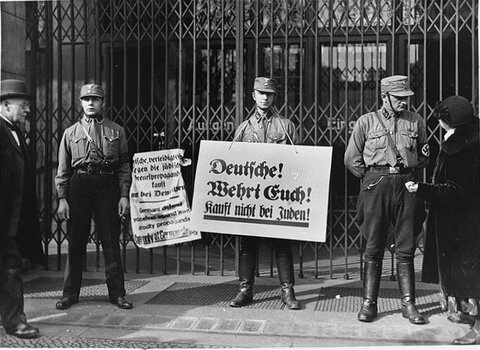 On April 1, 1933, Hitler took his campaign against the Jews one step further: he used his power to boycott all Jewish-owned shops and businesses. Hitler also began a massive attack against the rights of Jews, banning them from nearly all state activities and working positions. 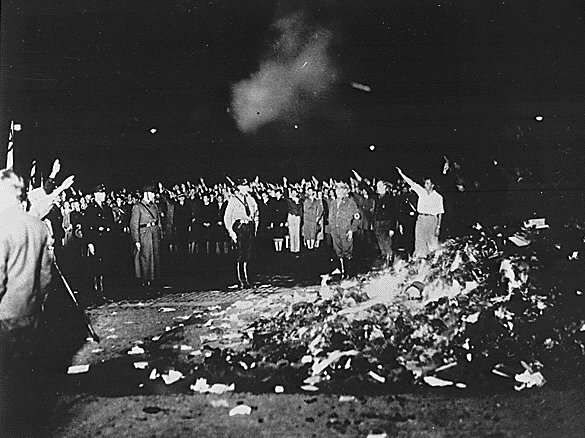 Nazis Burn Books In Germany! In order to "educate" the German nation with Nazi ideas, Hitler began with the youth of Germany. On May 10, 1933, students from universities once considered some of the world's finest participated in an enormous destruction of "un-German" books, including those written by some of the greatet thinkers of the centry as Albert Einstein, Sigmund Freud, Thomas Mann, Jack London, and many others.